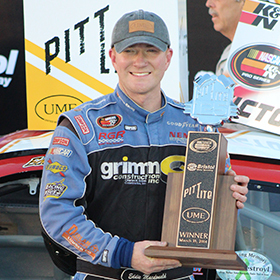 Eddie MacDonald knew what if felt like to visit victory lane in a NASCAR K&N Pro Series East race, but before Saturday’s win in the PittLite 125 at Bristol Motor Speedway he had gone 53 races without a win in the series. The series veteran and short track star used a little late-race magic in the closing laps of Saturday’s event to win his first K&N Pro Series East event since winning at New Hampshire Motor Speedway in September of 2009. For a driver who had been successful in the series in the past with six wins during his career, that period of time without a win began to wear MacDonald and his team out. It became frustrating and was no longer fun for the Rowley, Mass. driver and his team. The time in the shop doubled, the amount of calls to people searching for answers doubled, and when the end results didn’t reward their efforts, MacDonald wondered about his future racing in the series. Could “The Outlaw," the veteran short track driver with a lower budget keep up with the big boys of NASCAR? Could he hold off the flock of motivated young guns searching for a career in the higher-levels of NASCAR? MacDonald answered those questions with exclamation points on Saturday. The 33-year-old driver now looks towards the remainder of the 2014 season and hopes the momentum from his win at Bristol will translate into more success down the road. MacDonald, who is the only regular driver remaining from the old Busch North Series, knew it was going to be harder and harder to win these events as the years went on. Knowing that, MacDonald and long-time Crew Chief Rollie Lachance built a new car during the 2013 season to bring to select events. That car ended up finishing second at Iowa Speedway in 2013 and was leading at New Hampshire Motor Speedway in September before a flat tire caused heavy damage to his Grimm Racing No. 71. Over the winter, the team repaired that car and on Saturday the “new car” made its way to victory lane at Bristol. Following the win at Bristol, MacDonald planned to talk things over with his Russ Grimm-owned team to figure out their plans for the remainder of the season. Whether MacDonald and his team chooses to continue running the full K&N East season, or if they decide to pick and choose events, “The Outlaw” has proven that he is back and is once again a force to be reckoned with on race day. Eddie MacDonald displays his PittLite 125 trophy.